On Christmas Day for the last 30 years, MKCDPE have shown the appreciation for our elderly in the Milton Keynes area. Around the end of the seventies the Mayor held a Christmas Party at Wilton Hall for 25 elderly guests. 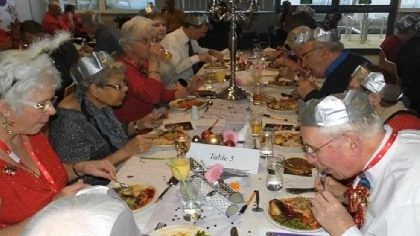 As the event grew, the venue moved to Argos Head Office on Avebury Boulevard in 1993 and became the Milton Keynes Christmas Day Party for the Elderly. In 2006 an opportunity arose for a new venue at the Santander Building in Shenley Wood. The move allowed easier access to the facilities for the guests. Many elderly are alone because their families are no longer in the local community or their spouses have passed away. On this special day, MKCDPE try to alleviate their pain of loneliness. The volunteers give our guests a gift which they cherish. The donations give the volunteers the tools and means to provide a gift which is remembered long after the Christmas decorations has been put away. A gift of companionship and smiles are given to our guests on Christmas Day in a friendly and festive environment! The day starts at about 9:30am when volunteer drivers collect the guests from their home and bring them to the venue. The guests are met by more volunteers, who look after them all day till they depart about 4:30pm. MKCDPE cater for about 100 elderly guests who would otherwise be spending Christmas day on their own. Volunteers are critical. Annually about 60 people extended either part or all of their Christmas Day at the event. Since many of the volunteers have volunteered for more than one year, they must enjoy themselves. The event has been managed for over 20 years by Ruth Seabrook and other members of the committee. Each year they literally go - hat in hand - requesting both donations and volunteers to keep the event available for the elderly guests. In 2016 MKCDPE lost their backing and quite a few committee members. 2017 they had to cancel the party through no fault of their own. So 2018 will be different, also the owners of the venue have redesigned their restaurant so MKCDPE have to cut their guest numbers down to 100. They will be looking for up to 60 volunteers this year also. MKCDPE are also looking for people who may just want to drive, i.e. collect the guest from home addresses and bring to the venue, then collect again at the end of the day and return home. Also, MKCDPE will be looking for donations. Which will be gratefully received be it large or small. All guests and volunteers can be booked via the MKCDPE website.